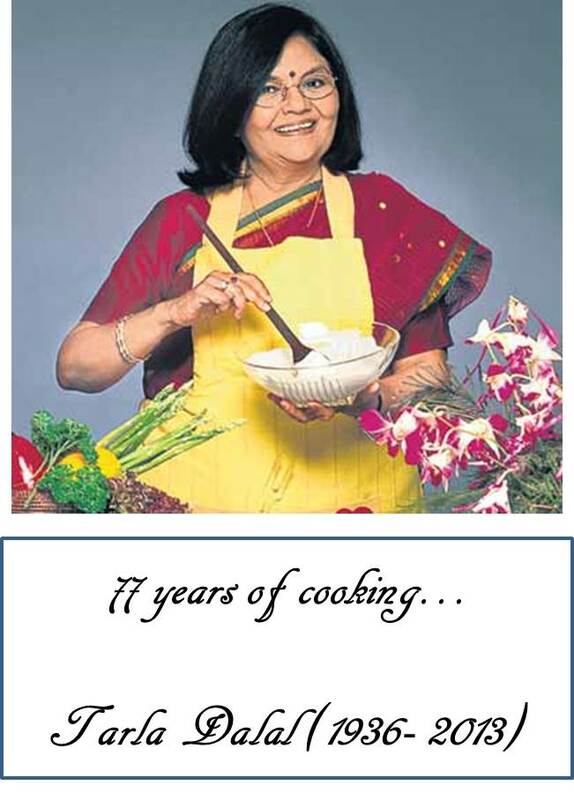 Padma Shri Chef Tarla Dalal passed away on 6 November 2013 following a heart attack. Her death announcement came as a shocker to not only the Culinary industry but to also aspiring foodies/food blogger’s like us. Tarla Dalal was an inspiration for Chef’s to take bold steps in their kitchen. She created a stir with her Vegetarian recipes to an extent that most non-vegetarians took to vegetarian tastes. She was most popular for her Gujarati preparations, and also wrote over 100 books that were like a Bible to many. She was the first ever Masterchef and had a celebrated TV show with leading channels. She also had a huge fan following, with many enthusiasts post their recipes on her site and making it the most visited chef website in India. She began taking home classes for cooking in Pune, where she was born and bought up. Post marriage she shifted to Mumbai. Tarla Dalal (77), is survived by 17,000 recipes, one of the largest websites in Asia and over 100 cookbooks. We pray and extend our condolences to her family and all her fans. May her soul rest in peace. ← Urbanrestro.com’s Bar-O-Scope Shows You The Recipe To Party!